Learn about the credit score scale. 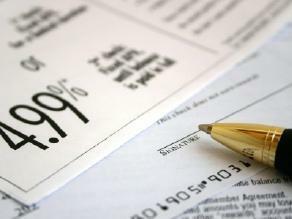 To explain APR interest, it is important to note that other types of interest formulas exist. APR, or Annual Percentage Rate, is a formula in which the percentage represents the total amount of interest charged over a 12 month period. Credit card companies commonly use APR interest and will state the APR on applications and in advertisements. The credit card company may state, for example, that it is offering a 12 percent APR on credit cards. This is a yearly rate, not the rate charged to you each month. Over the course of one year, the credit card company is charging 12 percent interest on the balance. APR is often on balances carried from one loan to the next, cash advances and balance transfers (from one credit card to another.) However, when a company states what the APR is on a credit card, that number does not represent all types of transactions occurring on the line of credit. The following are some ways credit card companies express APR for various types of transactions. Read the terms and conditions of your credit card statement to understand what these charges include. Purchase APR: This is the most common type of APR. Purchases made to the credit card will have a purchase APR calculated. This is the yearly amount of interest charged on purchases carried month to month (after the grace period expires.) Most credit cards have a grace period during which you may pay off the balance of the credit card in full to avoid any finance charges. Cash Advance APR: A cash advance is when a cardholder withdraws cash from an ATM or bank using the card, or writes and cashes a check against his or her credit card. Credit card companies charge a specialized APR against this type of transaction. The cash advance APR is commonly higher than the purchase APR. Balance Transfer APR: A balance transfer is an opportunity for an individual to pay off the balance of one credit card using another credit card. Balance transfer APRs may offer a special introductory offer, such as zero percent for the first six months. This means that when you transfer the balance of one credit card to another with the zero percent introductory rate, you will have a period of six months to repay the debt in full without paying any finance charges. However, all credit card users need to notice what the APR is after the introductory rate on the balance transfer, since it can be considerably higher. Penalty APR: On the documentation received by the cardholder at the time of sign up, the credit card company may list a penalty APR. This is the finance charge charged to the balance if you make a payment past the due date. This APR is significantly higher than the purchase APR. To explain APR interest, it is also important to note what makes a difference in this rate. Credit card companies assign APR by a variety of factors, most of which revolve on risk. The higher the amount of risk you are to a lender, the higher the APR will be. Keep balances on credit cards low. Ensure you are using credit cards within your means. Whenever possible, pay off the balance in full each month to avoid finance charges. Credit card companies often focus on credit scores when determining APR. The higher a credit score is, the less risk the individual poses to the company. Maintain a high credit score to qualify for a low APR. Apply for a credit card during a special offer time slot. Respond to offers only when the interest rates offered are attractive. Special offers may include introductory zero or low APR periods. Negotiate with your current lenders for a lower APR. Contact the lender and ask for a lower APR to apply to your account.